One of the main concerns of seniors who live alone is their safety. As we get older, we become more vulnerable, but there are many ways in which older adults can ensure their safety. Wear low heel shoes with non-slip soles to prevent falls. Avoid loose-fitting slippers. Remove scatter rugs or mats that can cause someone to trip over it. Stop smoking, if possible, and never smoke in bed or when alone as this is a fire risk. 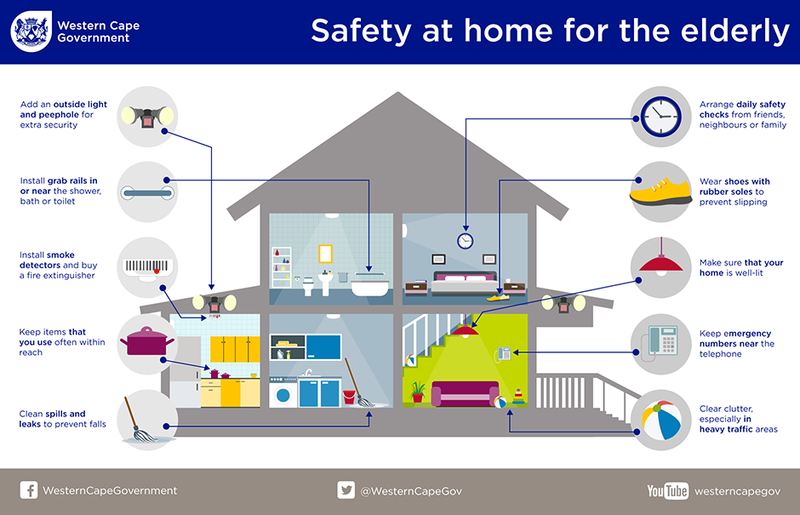 In winter, turn off heaters before leaving the house or going to sleep. Don’t use the oven to heat up your home. Keep your glasses, hearing aid, cane or wheelchair near the bed at night in case of an emergency. Clean spills and leaks immediately as they can cause a fall. Mark all medication clearly including the dosage and the times when it must be taken. Take medicine as prescribed and don’t adjust dosages without discussing it with your doctor. Avoid clutter so that there’s enough room to move around and to limit your risk of falling. Don’t carry heavy bags of groceries. Rather make more trips or ask a friend or neighbour to help you. Fit showers and baths with sturdy rails and non-slip mats and flooring. Towel rails, built-in soap dishes, shower doors, etc. aren't safe to use as hand rails and assistive devices. Place all containers, clothes, shoes, groceries, etc. within reach for easy access. Move electrical cords so that it doesn’t become a tripping hazard. Don’t add too many plugs to an electrical cord or socket. If possible, install smoke detectors and keep a fire extinguisher in the kitchen, bedroom and especially in rooms where there are fireplaces. Lighting in the house should be bright enough and a night light is a useful additional light source. The height of your bed should allow your feet to touch the ground when you’re sitting on the bed. Try and arrange regular maintenance of your house, electrical appliances and yard/garden. Ensure that the stairs are well lit. Always use the hand rails. If you’re unable to climb stairs, a stair lift can be installed. Keep a list of all emergency numbers, including the numbers of family, neighbours, etc. on the fridge, near the landline telephone and add these numbers to your cellphone. A medical alert device, such as an alarm with panic buttons will help you get assistance in an emergency. A family member and a trusted neighbour must have a spare key to your house in case of an emergency. Arrange daily safety checks from friends, neighbours or family. Have an outside light installed and a peephole so you can identify who’s knocking at your door before opening it. A safety gate can add an extra layer of security. Never allow anyone into your house who claims to be a policeman, TV licence inspector, municipal service provider (electricity, water and sewage repair), telephone repair technician, etc. before asking for an identity card. Be extra vigilant if it’s not a service you’ve requested, and confirm telephically with the head office. Being independent is important to older adults and good physical, social and mental health can ensure that. Making sure that your home is safe is an important step to avoid unnecessary accidents that can impact on your independence.